Here begin our findings on the ergonomic qualities of the binoculars in the study. Fit and feel are necessarily an individual matter, made up of the size, weight, shape, and balance of the binocular, the texture of the armoring, and a host of details. People respond favorably or unfavorably to indentations for thumbs, to the size, location, and style of the lugs to which the strap attaches, to the general tightness or looseness of knobs and hinges. Most of our testers like tethered lens covers like the ones on the Vortex Razor (left) very much, since it means the lens covers will never get lost. But some didn't like lens covers dangling down from the binoculars. One of our testers, whose hands are particularly large, scorned the compacts, preferring the way that full-sized binoculars fit his grip. Another tester said that a high-quality binocular that worked with her glasses and would fit in her small purse was "to die for." A great advance in binocular ergonomics was the use of rubber or synthetic materials to cover and protect the surface. 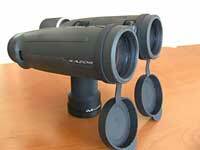 Armoring quiets bumps, secures one's grip, and makes binoculars much more hand friendly. Although virtually all the binoculars in our study incorporate pleasant armoring, the Swift 8.5 x 44 Audubon (Model 828) got an especially high score for fit and feel. It's pleasant to the touch, it's very non-slip, and it accomplishes its tactile effect without any ridges. Very elegant — just a subtle texture does the job. We think two binoculars stands out for especially good ergonomic shape. One is the Zeiss Victory FL. The barrels curve gently, just right to fill the palm of your hand comfortably. The other is Swarovski EL. The EL is distinguished by the hollow bridge. Your fingers can wrap around one barrel and reach down into the hollow, allowing you to hold and focus the binocular with one hand.